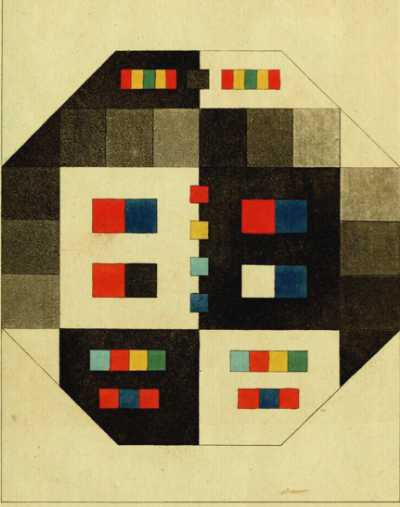 [Goethe] delivered in full measure what was promised by the title of his excellent work: data toward a theory of colour. They are important, complete, and significant data, rich material for a future theory of colour. He has not, however, undertaken to furnish the theory itself; hence, as he himself remarks and admits on page xxxix of the introduction, he has not furnished us with a real explanation of the essential nature of colour, but really postulates it as a phenomenon, and merely tells us how it originates, not what it is" (Schopenhauer, On Vision and Colors). 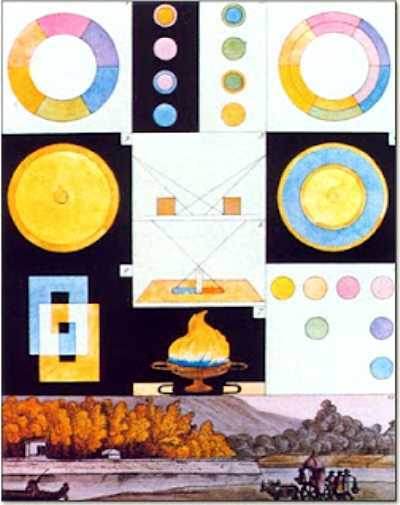 Zur Farbenlehre (Theory of Colors), written by poet, dramatist, novelist, and philosopher Johann Wolfgang von Goethe in 1810, is his work concerning the nature of color and how humans perceive it. 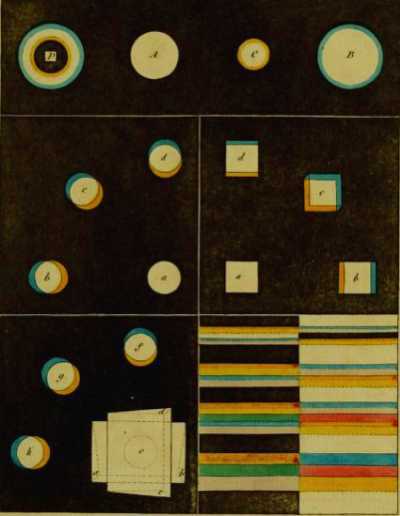 In it, Goethe, who was motivated by his interest in painting, describes, in some of the earliest published accounts, colored shadows, refraction, and chromatic aberations. 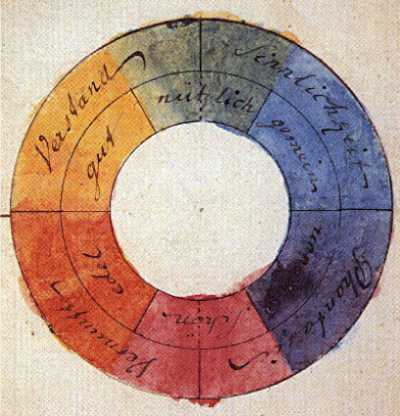 Goethe, in contrast to Newton, was not concerned with the physics of color, analytic measurement and the cold math. He concentrates on how we see it. "Along with the rest of the world I was convinced that all the colors are contained in the light; no one had ever told me anything different, and I had never found the least cause to doubt it, because I had no further interest in the subject. "But how I was astonished, as I looked at a white wall through the prism, that it stayed white! That only where it came upon some darkened area, it showed some color, then at last, around the window sill all the colors shone... It didn't take long before I knew here was something significant about color to be brought forth, and I spoke as through an instinct out loud, that the Newtonian teachings were false"
He does not bother with color as a physical phenomenon to be dissected. 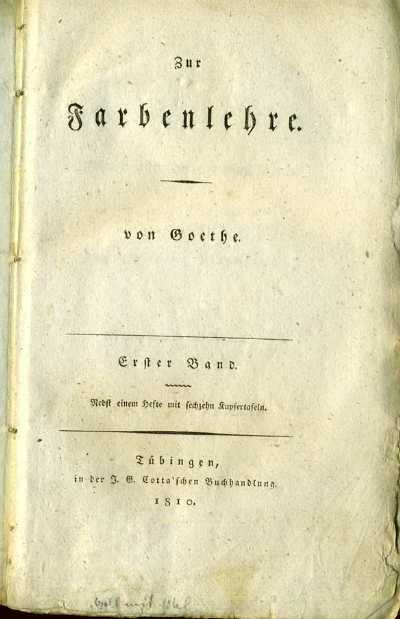 The book presents, to the contrary, Goethe's philosophy of color and how it is perceived in various situations. Philosophers and psychologists embraced Zur Farbenlehre; physicists rejected it. "Goethe's theory of the origin of the spectrum isn't a theory of its origin that has proved unsatisfactory; it is really not a theory at all. Nothing can be predicted by means of it. It is, rather, a vague schematic outline, of the sort we find in James's psychology. 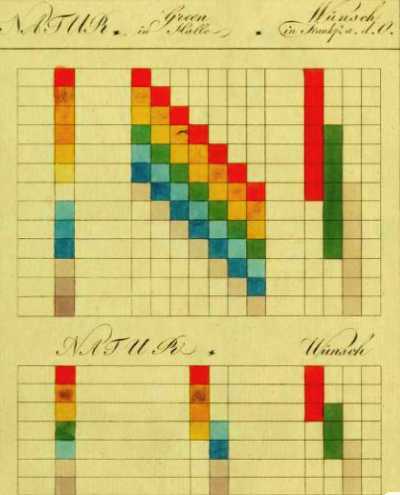 There is no experimentum crucis for Goethe's theory of colour" (Remarks on Color). 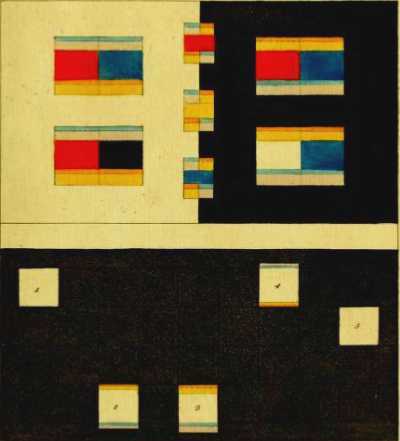 Goethe talks about light and darkness, boundaries, the light and dark spectra, and the history and influence of color on the arts, in philosophy, and, of all things, on Latin American flags. 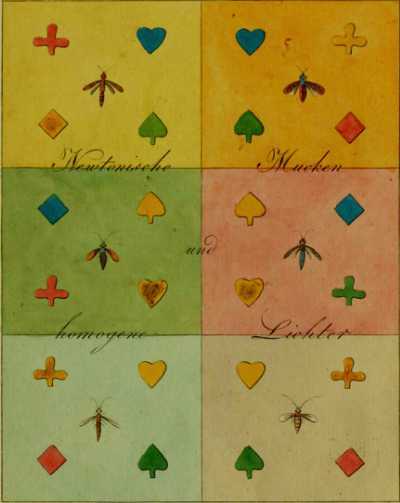 If any of the gorgeous plates in the book, such as the above, seem vaguely familiar, it is because Zur Farbenlehre had a major influence upon modern art, i.e. no Goethe, no Kandinsky, et al. 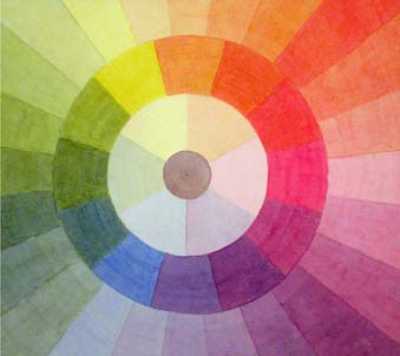 "Goethe's colour theory has in many ways borne fruit in art, physiology and aesthetics. But victory, and hence influence on the research of the following century, has been Newton's" (Werner Heisenberg). "Can you lend me [Goethe's] Theory of Colors for a few weeks? It is an important work. His last things are insipid" (Ludwig van Beethoven, Conversation-book, 1820). GOETHE, Johann Wolfgang von. Zur Farbenlehre. [with] Erklärung der zu Geothe's Farbenlehre gehörigen Tafeln. [with] Anzeige und Uebersicht des Goethischen Werkes zur Farbenlehre. First edition of the text volumes of Goethe's work on color theory, second editions of the companion volumes Erklärung and Anzeige (plates). Tübingen (and Vienna): J.G. Cotta, 1810 and 1812. Two octavo and one quarto volumes. Dictionary of Scientific Biography V, pp. 442-446. Hagen I, 347, 348b, 348c. Images courtesy of Asher Rare Books, currently offering this item, with our thanks. It is perhaps worthwhile to point out the goal of Goethe's approach was not to arrive at a Law of Nature, but rather the read the phenomena of Nature, as you or I would read a book. This is more clearly articulated in his work on the metamorphosis of plant, but it speaks to a distinction between methodologies. In this sense Schopenhauer misunderstands or is ignorant of Goethe's approach. Goethe is in fact clear about what color is: "colors are the deeds and sufferings of light". This is not metaphor. Thus Goethe did not wish to imagine, as did Netwon, "what is really happening" with colors and light by inventing invisible bits and assuming the bits define the whole. Goethe always stuck with the phenomena and observed carefully over time to be able to apprehend the whole of the phenomenon. This has engendered what is known as "Goethean Science".